Sometimes the smallest of details can be very telling. Fong Kay arrived in Australia around 1860 and, in time, made his home at Indigo in north-eastern Victoria. From the late 1870s, he appears as the informant on various birth and death registrations for the children of Ah Kone and Mary Ann Jones, where he was described as ‘granduncle’ or ‘uncle’. Ah Kone’s mother was Fong Shee, so it’s possible that Fong Kay and Ah Kone were cousins of some kind. Fong Kay was described as a gardener, but he was not your typical one – in 1891 he was included in a list of Victorian wine growers, with three acres of grapes at Indigo. * Ah Kone and Mary Ann Jones’ daughter, Jessie, ran the Indigo store with her husband Chin Ah Shing. Fong Kay lived across the road from the store, which had a joss house and the Indigo post office next door. The family also had connections to the viticulture industry in nearby Rutherglen. 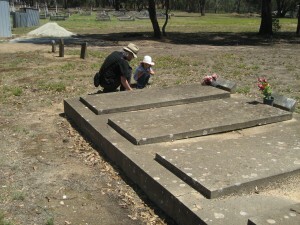 Fong Kay died from pneumonia on 22 September 1911 and was buried in the Chiltern Cemetery. He was said to be 87 years old and had been in Australia for half a century. His grave lies alongside those of members of the Shing family, including his ‘niece’ Jessie Shing, and that of Hoy Gee, another long-term Indigo resident who boarded in Jessie’s home after her husband’s death. Fong Kay’s death registration records that he was married, in Canton, China, at the age of 21, but the name of his wife was ‘not known’. In the next column, headed ‘Issue, in order of Birth…’, was written: ‘One boy, name unknown’. It’s likely that, like many gum saan po (Gold Mountain wives), Fong Kay’s wife and her son knew little of his whereabouts over those many years. Then you left me for Gold Mountain. For twenty long years you haven’t returned. For the faraway sojourner who hasn’t come home. Endless longing for you only brings streams of falling tears. * See Cora Trevarthen, ‘After the gold is gone: Chinese communities in northeast Victoria, 1861–1914‘, Journal of Chinese Australia, issue 2, October 2006.